You are currently browsing the tag archive for the ‘farm bill’ tag. Hey Locavores Are You Creating Jobs? NWEI Curriculum Director Lacy Cagle just passed along this article from NPR, which states that every million dollars in sales through local markets supports thirteen jobs, versus the three jobs generated from every million dollars in sales by agricultural operations that don’t have a local or regional focus. 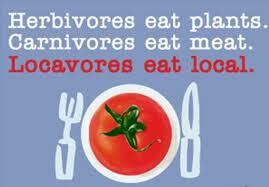 All the more reason to get behind the local, sustainable food movement! For the full article by Allison Aubrey, click here. “When we think of the farmers we know, we can count a lot of locally-produced food we’ve reported on, from unusual greens to pawpaws. And when the Obama Administration and the U.S. Department of Agriculture promotes their Know Your Farmer, Know Your Food initiative, what do they count? Jobs. “Every million dollars in sales through local markets supports thirteen jobs,” USDA’s Kathleen Merrigan said in a conference call with reporters. This compares to three jobs generated from every million dollars in sales by agricultural operations that don’t have a local or regional focus. To tout the growth of the local food movement, USDA has launched a slick, new, multimedia website that includes videos, photos and a map showcasing all the USDA-supported projects (think: loans and grants). Many are aimed at helping communities coordinate the sale of locally grown fresh food products from small and mid-scale family farms. Another goal is to support regional food hubs. By positioning the initiative as a “jobs-creator,” Merrigan may be hoping to assuage detractors on Capitol Hill who have criticized Know Your Farmer as a program for the foodie elite that promotes organic and niche farming over conventional, larger scale operations. “In the name of promoting local food systems, [USDA] appears to be prioritizing Rural Development grant and loan programs for locavore projects in urban areas, apparently at the expense of rural communities,” complained Senators Pat Roberts (R-KS), Saxby Chambliss (R-GA) and John McCain (R-AZ) in a letter to Agriculture Secretary Tom Vilsack in 2010, after the program was created. The lawmakers point out that the vast majority of the nation’s food supply comes from these conventional, large-scale operations. In an early version of the 2012 Appropriations bill, lawmakers in the House moved to de-fund marketing of the Know Your Farmer initiative. Even though there were similar concerns in the Senate, ultimately the program kept its funding. But USDA was told to give a status update. That’s part of what USDA accomplishes with this new, web-based Compass. Even so, local food advocates are concerned the program could be cut out of the farm bill, set to expire this year.